Free Mother's Day Cinquain Poem. A Holiday Poem Activity. Print and go Mother's Day writing activity. 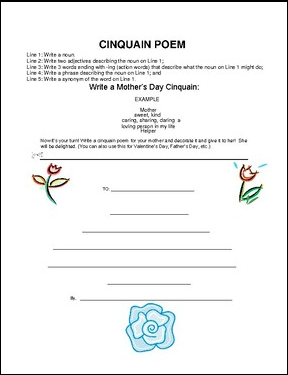 This handout gives directions for writing a cinquain poem, an example of how it works, and a place to create your own to cut out and give as a gift. Looks lovely in a frame. Create one with craft sticks, hot glue, and decorate with paint and buttons, sequins, etc. Look for the green star at the top of any page within my store and click it to become a follower. Go to your My Purchases page (you may need to login). Beside each purchase you'll see a Provide Feedback button. Click it and you will be taken to a page where you can give a quick rating and leave a short comment for the product. ©2016 HappyEdugator. This product is the intellectual property of Deborah Hayes aka HappyEdugator. This material is protected under the Digital Millennium Copyright Act.